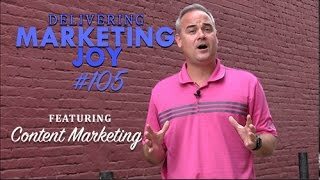 This week in Episode 105 of Delivering Marketing Joy!, we have decided to add several clips together from previous DMJ episodes. This week’s clip combination concerns content as well as different aspects of creating subject matter. Let us reach you through some great thoughts that might just answer some questions you had about content creation. Bill Petrie is in the first two clips as he discusses building his business from the ground up! He reveals how both media and constantly creating new content helped grow his business and add to his profit margins. Without content, you can’t place your business out there for the public to find. Seth Godin hits a home run with his conversation concerning how to differentiate yourself and your business. This section highlights what people need to do when trying to make sure their company is noticed. Jeff Haden is spot-on point regarding his ideas on how to get people to respond to you. He discusses focusing what you can do for them, and not what they can do for you. Pinpoint what certain people will react to and how to keep the connection going.Mike Schenker discusses the difficulty with finding new content without reusing the previous material. These men are all professional in their fields, so take the time to listen to what advice they have to give! Want to keep up all the time? Make sure to join our VIP List! Our VIP’s get an email with the latest content…and other special offers as well. Join here.